(SPOILERS) If anything, the fourth episode goes even goofier than the third, before sobering up dramatically for the final scene. There’s at least one innocuous cameo here, Richard Chamberlain pulling the equivalent of George Hamilton in The Godfather Part III, but it’s most notable for the arrival of Naomi Watts and Robert Forster, and the return of Dana Ashbrook and David Duchovny. And… Michael Cera? Wally: My shadow is always with me. Sometimes ahead. And sometimes behind. Sometimes to the left. Sometimes to the right. Except on cloudy days. Or at night. Maybe the battiest thing in the third season to date, and that’s saying something, is Cera’s appearance as Wally Brando (born on the same day as Marlon), Andy and Lucy’s son, his appearance plays like an extended skit, with Lynch cackling away behind the camera, eager to see how long he can string it out. You pretty much get the impression that, when Forster’s Sheriff Frank Truman, Wally’s godfather, turns heel and walks off, Forster really has had enough. Cera’s doing a Brando shtick, dressed out of The Wild One, announcing he’s “decided to let them do as they wish with my childhood bedroom” and waxing philosophical about life on the road. (He also mentions the Lewis & Clark expedition, which is very significant to The Secret History of Twin Peaks). I found it hilarious, but it seems to have provoked the most Marmite reactions of anything Lynch and Frost have served up so far. Lady Slot-Addict: Thank you, Mr Jackpot. Thank you. 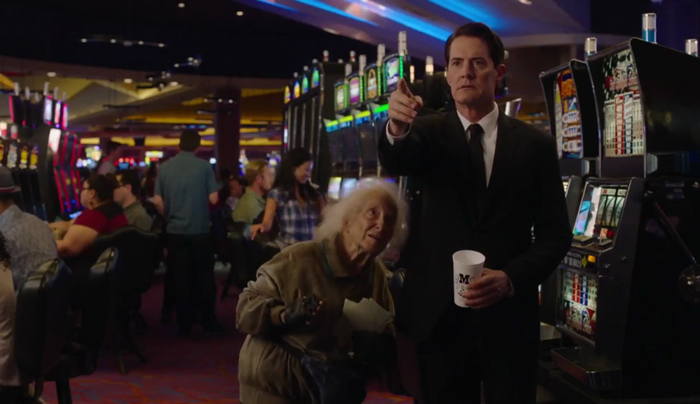 Most effortlessly watchable is the continued adventure of Special Agent Charlie Babbitt, as Cooper finishes up in the casino having scored 29 mega jackpots, giving an old bag lady a few too (“Mr Jackpot, tell me which one”). 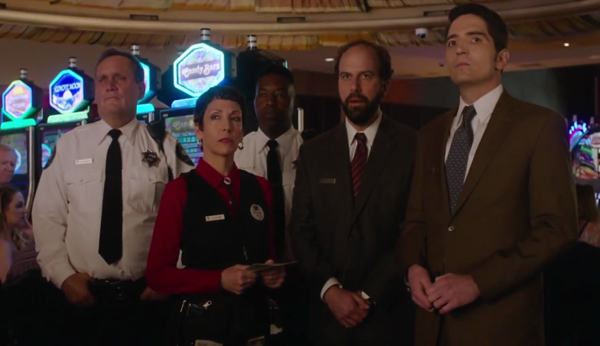 I love Lynch teasing out scenes in a complete lack of hurry, such as Brett Gelman’s supervisor handing over the winnings and giving it the tough guy act (“That’s right, we’re watching you, Mr Jones”) while having absolutely no idea what’s going on. 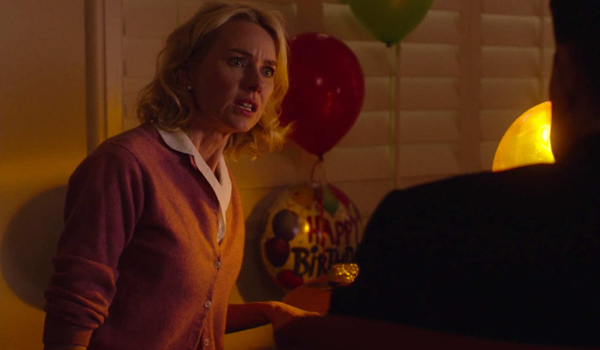 And then the reveal that Dougie somehow ended up married to Naomi Watts (Janey-E Jones), with a son(ny-Jim). By way of an equally baffled limo driver, prepared to wait outside the house with Cooper… well, forever if she hadn’t come out. Janey-E: This is the most wonderful horrible day of my life. It’s still unclear what trouble Dougie had got himself into, but Janey-E knows about it (of the winnings she observes there’s “Enough here to pay them back”), and she’s obviously used to Dougie being as inept as Coop currently is (the scene where he learns how to urinate is priceless). There are several cues to his greater quest (“You were tricked. Now one of you must die” he is told through the carpet), and there’s a memorable repeat of the Season Two finale’s mirror scene, but the biggest treat is his reaction to first pancakes and then coffee – if that won’t bring him back, nothing will (albeit his not-son is also doing a grand job)! Back in Twin Peaks, the gag with Lucy and cellular phones doesn’t quite play, but it’s a good try. The twist with Bobby now being in the police is a neat one, although again, his breaking down at the sight of Laura’s photo doesn’t quite deliver (I’ve seen praise for the moment, but it fails to play as melodramatically as a similar scene would have in the original). Better is the ignorant deputy having no time for the eccentricities of the town, including Margaret (“I thought that log woman was a 10-96 and not even allowed–”; “I’m going to have a word with my pine cone”). 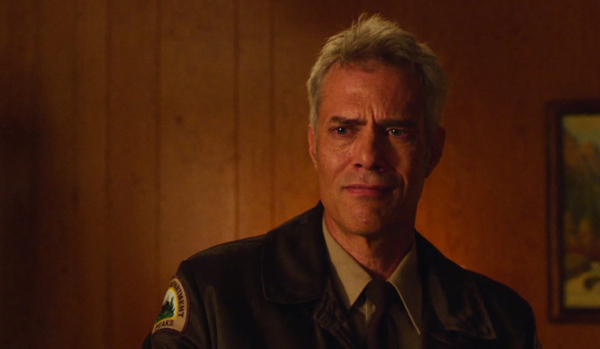 And we get confirmation of more The Secret History of Twin Peaks information, that Cooper was the last person to see Major Briggs alive. Gordon: There is room in this FBI for more than one beautiful woman. Denise: That is so sweet. 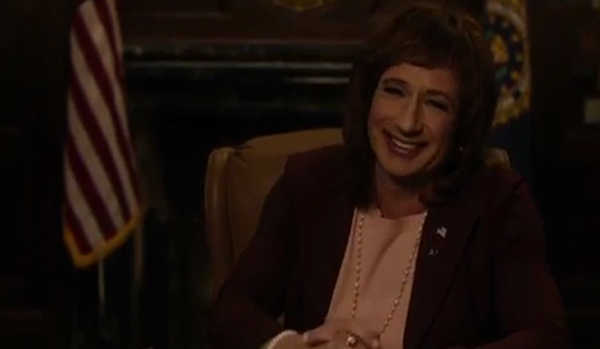 The FBI side is also kicking into gear, with David Duchovny’s Denise Bryson – I hope there’s more of her in this, as Duchovny’s having a ball, and it’s good that Lynch takes to the character, Dennis/Denise having floated around when he didn’t have much to do with the series and it was generally at its lowest ebb – clearly aware of Gordon’s/Lynch’s thing for the ladies and only comfortable sending him off to South Dakota with Agent Preston when she knows Albert will be chaperoning (given Albert’s reaction to seeing Preston’s sashaying hips, maybe she shouldn’t have been). Gordon: Albert, we’re in South Dakota. Cossacks are in Russia. The interview with evil Cooper is perfectly off, from the strained thumbs up to his slurred vocal pitch. But the yarn Cooper spins at least has a grain of truth; he says he has been working undercover all these years, primarily with Phillip Jeffrey (and that he’s left messages “so Phillip knows it’s safe”). Albert admits that, years before, he authorised Coop to give Jeffrey information concerning the bureau’s man in Colombia, and a week later the man was killed. Lynch and Ferrer are particularly riveting in this carpark scene – you could hear a pin drop – Lynch particularly notable for holding his own when generally in the past he has opted for sendup. Scenes like this emphasise the director’s masterful sound design; music is remarkably absent from the series, replaced by an unnerving background hum (the interview scene in particular) or even audible silence. Gordon: I hate to admit this, but I don’t understand this situation at all. Do you understand this situation, Albert? Part of the pleasure of this season in its early stages is teasing expectation; of Cooper reconstituted and reintroduced to old faces, and of pieces of puzzle proving vital and others proving irrelevant. 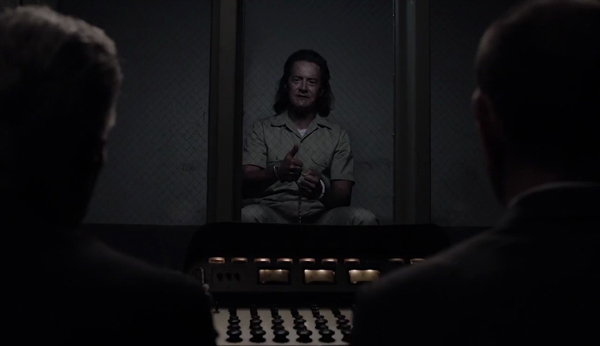 But so far, Frost appears to be ensuring Lynch steers a thoroughly engaged ship, and the consistency of this run is already more marked than even the first season, albeit as a very different beast. 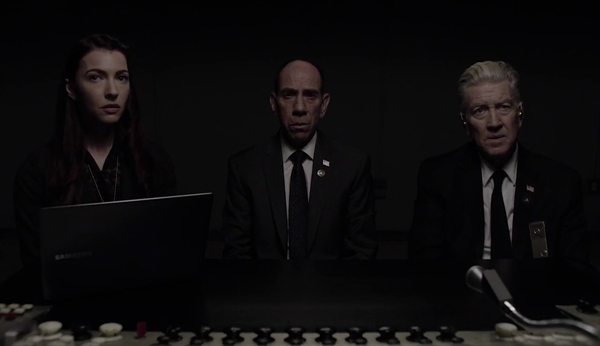 The ending, referencing blue rose, is a nod to Fire Walk with Me and Cole’s case categorisations (blue rose cases involve supernatural events, is the implication, unsurprising then that a big floating Major Briggs head should have mentioned the phrase in 3.3), but it would appear there’s also a human personification of this (“I know where she drinks”). Laura Dern’s character?